At the start of Ralph E. Laitres’s epic fantasy novel, Thorgil Bloodaxe: Enter the White Queen, the titular hero, Jomsviking warrior Thorgil Bloodaxe is a struggling mercenary who travels the countryside and sells his services to whomever is willing to pay. Before long, the shadow of a deed many years in Thorgil’s past raises its ugly head to intrude upon his present. Years before, he had successfully dispatched the evil Karelia of Trolleboten after a long and arduous fight. Now her sister, the sorcerous White Queen Hvit has discovered Thorgil’s whereabouts and her mind is bent on avenging her sister’s death. Thorgil quickly runs afoul of her minions, but also discovers that he has help from unexpected quarters, namely the mysterious being known as Swan of Kaleva. With Swan’s advice, hints and amulets, Thorgil sets out to find the White Queen’s lair and root out the evil plans that she has for his homeland and himself. Along the way, Thorgil encounters fantastic creatures from Nordic mythos and gathers about himself a band of seemingly loyal soldiers and warriors to aid him on his quest. He soon finds himself the center of a plot to gain admittance into the White Queen’s lair. Not everything goes as planned though and Thorgil must depend upon his wits and—more often—his spectacular brawn and finely honed fighting skills to bring his scheme to fruition. Big battles ensue as well as smaller, but bloodier skirmishes, as Thorgil makes no distinction between engaging one man or twenty. He is very good at both. Crosses and double crosses, myths and legends all blend to bring about a rousing climax that delivers on all promises. Will the warrior known as “the Bloodaxe” triumph over evil? A breath taking read to discover the outcome. 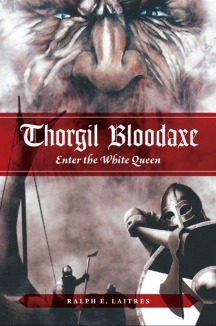 Thorgil Bloodaxe: Enter the White Queen is one of those indie books that makes me so very glad for and proud of the indie/self-published authors I know who work tirelessly to not only write a well thought out novel, but who also edit, market and promote that novel on their own dime. This novel raises the bar on so many different levels that I feel the need to address a few of them before getting into my story review. First of all, this novel is probably the most cleanly edited self-published book I’ve read in a long time. I can recall only a single period that was out of place and the tricky italics structure in some parts of the novel were handled with care and precision. Second of all, the plot runs smoothly from start to finish and each scene is crafted with a painstaking attention to detail, once again well outside the norm for indie books. Third of all, you have only to google “Thorgil Bloodaxe” and you will soon discover that the marketing for this book series (there is already a second book published, see below, and further volumes planned) is phenomenal. There is an abundance of Thorgil book pages, availability on every platform, a Thorgil Fan Art page (see links below) that you should really check out, and even a Thorgil LinkedIn account! Mr. Laitres exemplifies a virtual clinic on how to successfully market your own book. The artwork alone (paid out of pocket by Mr. Laitres to accomplished artists) raises the universe of the Bloodaxe (red) head and shoulders above the “clutter” of the indie/self-published landscape. If Mr. Laitres ever decides to hold an actual clinic on how to do this, I will be there and I recommend that you are there, too. On to the novel review. What a great story about an amazing hero by a writer who truly, truly understands his creation. The research into the Nordic mythos has been commented upon by just about everyone who has read the book. More than that you get the strong sense that Thorgil exists not only on the page, but also prior to the page with a detailed past that is so much more than mere backstory. He marches into the first scene a complete character in a complete universe that has all its own carefully constructed laws and histories intact. Each new personality that enters the story only adds to the complex tangle of intrigue woven around Thorgil as he continues on his way to the lair of the White Queen. I found Thorgil Bloodaxe to be a very likeable hero, while at the same time exhibiting some of the foibles expected of an old-school “low” fantasy (think Conan) hero. For one, keep the Jomsviking away from the wine, please. The evil White Queen antagonist also harkens back to that older style of writing where there is room for her to be a little swanky and seductive while also ripping men’s hearts out. This book is for people who love a good—make that great—story. It’s not slick or sleek or even (heaven forbid) “postmodern”, but rather it’s a rousing tale of adventure with a good, old fashioned hero. Epic Fantasy with an amazing central character and expert storytelling–highly recommended! 1. Describe the moment you realized you wanted to become a writer. A.I had a love for writing since grade school. I first started writing horror short stories that would shock my mother. In High School, I began to dabble with fantasy adventure, or what is now known as sword and sorcery. 2. Who is your favorite author and how did s/he influence this novel? 3. What is the most unusual inspiration (place, book, person, etc.) that you can credit for your novel? My studio gives me great inspiration with all my Viking statues, and Thorgil Bloodaxe by such illustrators as Savy Lim, Pablo Marcos and Bart Sears.